Marianne Coble will introduce us to the Surma and Mursi tribes from Omo Valley, located inAfrica’s Great Rift Valley. The Omo Valley is renowned as being one of the most uniqueplaces on earth because of its culture and wide diversity of people and animals that inhabitit. These nomadic people are self-decorators, all without the use of a mirror. They paintedtheir faces daily using plants, flowers, grasses, nuts and berries. 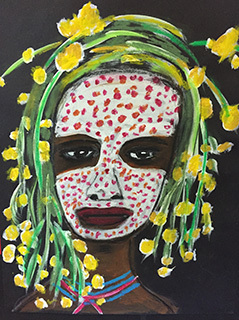 Students will use acrylicpaint, oil pastels, crayons and charcoal to create a unique tribal portrait painting on blackpaper. 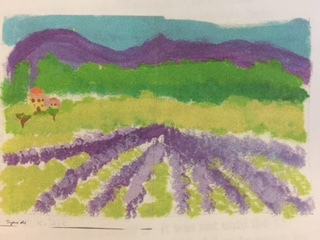 Students will paint the Monarch butterfly on a gessoed canvas and add the skylineand clouds. Before adding the acrylic paint, the class will discuss the lighting of thepiece. Where is the light source and what effect would this source have on thesubject? Would the lighting cause shadows or a reflection on the water? Studentswill paint in the ocean waves adding shading to the waves to create the illusion oflight. 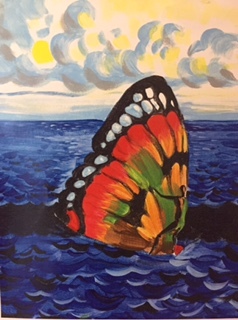 Students will then paint the sky using swirling brushstrokes and then paint thewings of the butterfly and add the surfer with shading to show the source of thelight. The class will also discuss about the rules of prospective for this piece andhow making the ocean larger than the sky would make the subject appear muchcloser to the viewer. Jennifer Siegal was inspired by artist Gustave Caillebotte’s painting, ‘Paris Street; RainyDay’. Students will be introduced to an Impressionist artist who painted narrative scenesusing figures. Students will have an understanding of linear perspective, cropping andzooming effects, soft and hard edges to create a sense of depth. 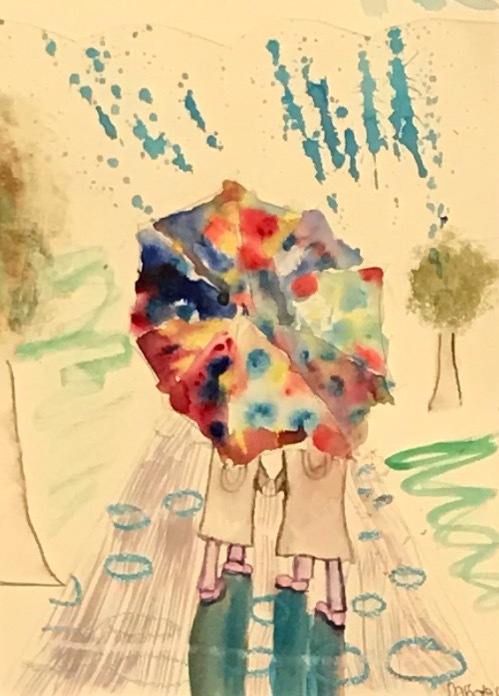 Students will usewatercolors to paint figures walking underneath umbrellas. Salt will be sprinkled over wetwatercolors creating an interesting pattern for the raindrops. Jerry Schurr first became known for his rugged American landscapes of the Western UnitedStates, using the “reduction” method of painting and silkscreen printing. His abstractlandscapes included magnificent vistas of distant canyons, rugged shorelines, vast valleys,and other natural wonders. This will be a class teamwork project to create the differentcolor palette on rolls of paper. Students will notice how lighter color values can give theimpression of greater distance, and darker color values can give the impression of closerproximity to the viewer. 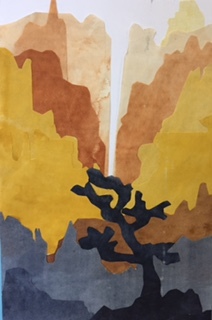 Students will construct their own landscapes from their mind’s eye,using watercolors and torn paper in graduated levels creating intensity. Students will play with paint and in the process, they will learn how "value" an element ofart, changes a color and how these changes serve as a tool to the artist in creating theillusion of depth on a flat surface. Students will be inspired by the artwork of Ton Schultenwhile creating their own landscape by using lines and shapes. 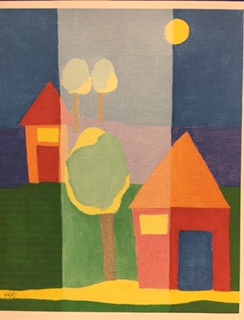 Students will draw and painta "mosaic-like" landscape using acrylic paints on a canvas board. Next, they will draw ahouse and tree in foreground and house and tree in middle ground or background to createthat illusion of depth. Finally, they will paint their drawings with original and tinted hues andexperience first hand, how a color's value is affected by mixing in white. 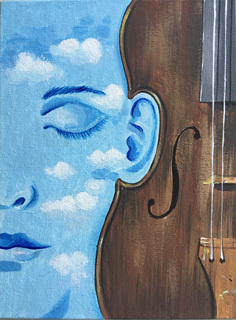 Students will paint a violin and facial elements on a gessoed canvas. They will learnabout lighting sources and what effect would this source have in their painting.The final step will be to add clouds using their small fingertips. Students willexperience the Surrealism period. A period in art history when artists createddreamlike paintings filled with mysterious objects or familiar objects that have beenchanged in ways that you would not see in reality. Jake Tedesco was inspired by artist Camille Pissarro’s painting, “White Frost”. Students will learn the mathematical properties behind perspective drawing and then use that knowledge to create a painting showing depth. They will paint using different brushstrokes and add shading and highlighting to make their painting look real.